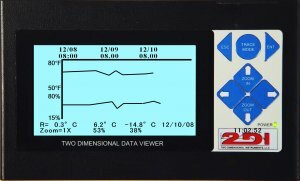 The TV2 QuickCheck monitor uses state-of-the-art differential pressure (±0.007wg” or ±0.002wg”) temperature (±0.3°C) and humidity (±1.5%) sensors to check the environmental conditions every few seconds. Each sensor comes with a NIST traceable calibration certificate, are highly engineered and designed to maintain their accuracy for many years. Each has excellent repeat-ability in addition to solid stability. Each sensor his its own calibration table and analog to digital converter to ensure accuracy. The sensors can be mounted remotely up to 300′ from the TV2 monitor. 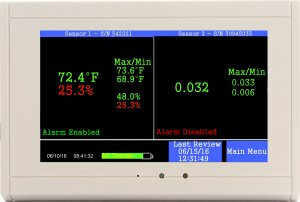 Configuration of the monitor is done via a menu on the touch screen, and takes just a few minutes. 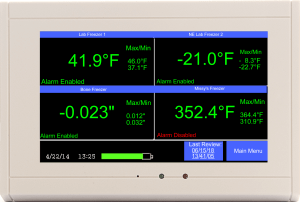 The TV2 Cleanroom monitor is a temperature, humidity monitor and differential pressure monitor. If either temperature, humidity or pressure begins to drift outside of the ‘safe zone’ that condition turns red, until the condition moves back into the safe zone. 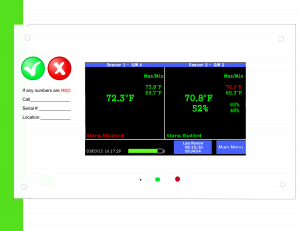 The TV2 cleanroom monitor also logs each of the three environmental conditions; differential pressure, temperature and humidity, every few minutes, far exceeding the ISO14644 requirement for all cleanrooms. 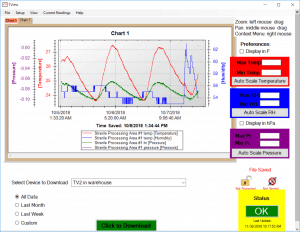 Each variable is not only displayed so you know what the current conditions are but the logged data for each variable can be viewed on the screen or downloaded to a PC and printed out as a line chart. Once the TV2 is part of a Local Area Netwok all logged data can be automatically be backed up to the computer. A Chart can be viewed at any time. All logged data can also be exported into Excel. (This, however, breaks the 21 CFG 11 requrements.